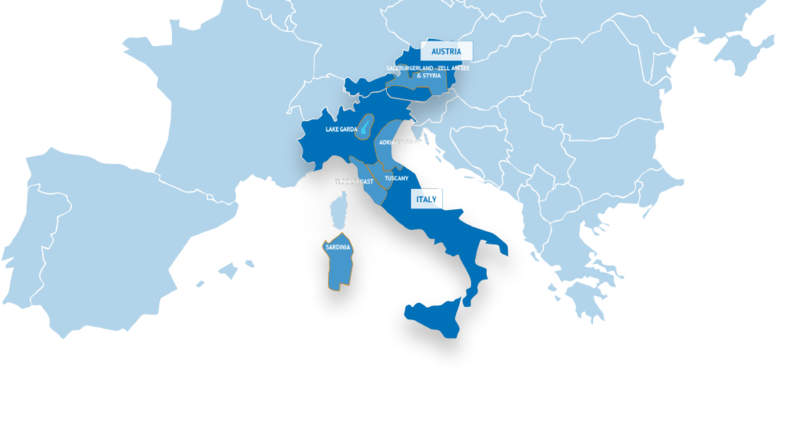 Affordable May holiday in Italy! 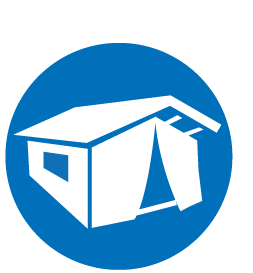 Book now your affordable May holiday at one of Italy’s top campsites at Gustocamp! The discounts are up to 40%! We have made a list with our best offers. Where do you want to spend your holiday? The May holiday is the ultimate period for a break and to enjoy the lovely Italian sun. Temperatures are up to 22 degrees, perfect for a swim in one of the swimming pools or to paddle in the sea. At the end of the day you can enjoy the Italian food and drinks, with a vest of sweater you can still sit on the terrace outside. You end the day with a beautiful sunset. Many or our campsites offer a heated swimming pool, which means you can already enjoy swimming in preseason. Not all outdoor swimming pools are opened , because the non-heated swimming pools can still be cold in the spring. The May holiday is the perfect time to combine a relaxing holiday with a cultural visit to one of Italy’s beautiful cities. A Gondola ride in Venice, get a drink on a terrace in Verona or walk through the centre of Florence , like family the Medici. The temperatures in May are really pleasant, but not a high as in summer. That makes it ideal to visit some of the cities with your family. 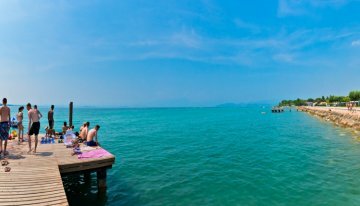 Great last minute offers on Lake Garda for May holidays! 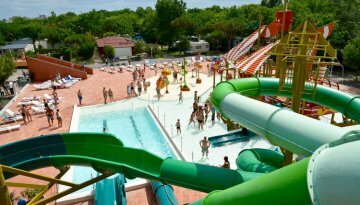 The swimming pools at Campsite Cisano San Vito are open at the end of April. These pools are heated by the sun. 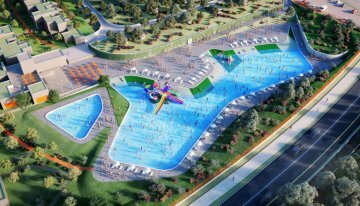 The swimming pool is approximately 30 by 15 meters and around 1.50 deep. The separate children’s pool is approximately 6 by 5 metres. The swimming pool in the San Vito part is not open yet during May, but from June. 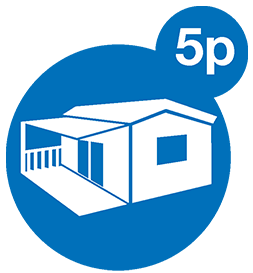 At Campsite Cisano San Vito you can rent a mobile home or tent in May with a discount up to 30%. 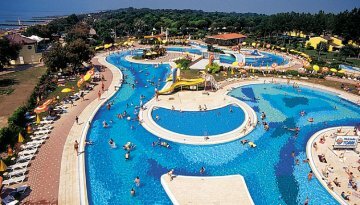 There are 4 swimming pools at Campeggio del Garda, 2 of these pools are for the youngest guests. Both of these pools are not heated. All swimming pools are open since the beginning of May till mid-September. 1 of the bigger pools is heated. 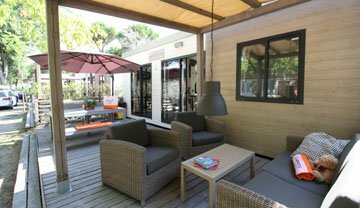 At Campeggio del Garda you can rent a mobile home or tent in May with a discount up to 30%. Both swimming pools of Villagio Eden are open during May and are not heated. Villagio Eden is on walking distance of the small harbour of Portese. Here you can find some nice restaurants and you can make a boat trip. 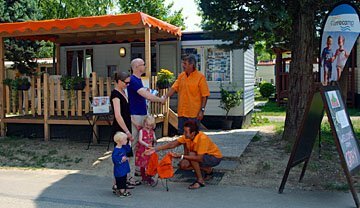 At Villagio Eden you can rent a mobile home or tent in May with a discount up to 40%. -	Amusement park Gardaland: the biggest amusement park of Italy with over 50 attractions. There is a lot to do for both young and older children. From exciting rollercoasters till spectacular whitewater rides and shows. -	Sealife: amazing underwater world with large rays, sharks ,sea lions, small clown fish and sea horses. You can walk through a tunnel and see the fish swimming around you. -	Boat trip: one of the easiest transportation ways to discover the lake Garda. You can choose a specific town by boat or you can sail a half or full day. Whichever boat trip you pick, the view is always spectacular. -	Daytrip Verona: the city of love, city of Romeo & Julia. Verona is on the list of Unesco with her beautiful historical city centre and the impressive arena. Offers for the May holiday at the Adriatic coast! There are 2 swimming pools at Campsite Spiaggia e Mare: 1 pool is open from 12th of May and the 2nd pool is open from 21.4. Go to Venice by boat from the harbour of Chioggia. Visit Venice: this special city is on the list of Unesco. It’s the perfect period in May with an average temperature of 22 degrees to visit this beautiful city. Off course you can’t miss the historical attractions such as the Rialto bridge, Dogen palace and San Marco place. But there is even more to discover. Campsite Etruria is directly located near the beach. In May the average temperature is around 21 degrees. Perfect weather to spend your holiday. From a path of the campsite or across the beach you can walk to the village Marina di Castagneto Carducci. In this small centre you can go to one of the restaurants or enjoy the beautiful sunset at the beach while eating a delicious ‘gelato’. Great last minute offers May holiday in Sardinia! 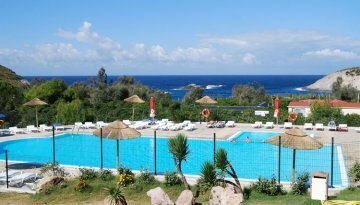 Campsite Tonnara is situated in the south west of Sardinia, near the well know village of Sant Antioco. In May it feels like with summer with a temperature which varies between 20 and 25 degrees! -	In the surrounding villages of campsite Tonnara you can find archeological treasures. Are you not quite sure where to go in May? Call with one of our colleagues at the Gustocamp office. Monday till Friday reachable from 9.30-17.30 at telephone number +44 (0)1706438006 or send an e-mail to info@gustocamp.co.uk.